I just had a conversation with a very wise friend of mine about making deposits and withdrawals in our life and our relationships. How often are you making deposits into yourself and into your relationships? What about making withdrawals from life, yourself and your relationships? I had never thought about it using these words. My friend went on to explain what she meant and a great conversation took place. 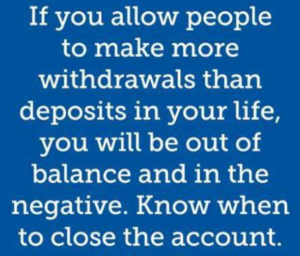 Do you accept people making withdrawals from you more than they are making deposits? Do you allow people to disrespect you and treat you unkindly without letting them know it feels lousy and you want it to stop? How about from yourself? You deposit into yourself each time you do a good deed, read inspirational things, pray, meditate,write in a gratitude journal, exercise, make good food choices. etc. You’re making withdrawals from yourself each time you choose not to do the things in the list above. When it relates to money, we understand the concept of withdrawals and deposits. For example, If I go to the bank and try to make a withdrawal and haven’t deposited money into that account, the bank teller will tell me that there are insufficient funds in my account. I can’t withdraw what I haven’t deposited. Same in your life and relationships. If you aren’t giving to your relationships and to yourself, making deposits regularly, there’s very little in your relationship account, right? Our life has other types of accounts besides money. The same problem occurs when we try to make withdrawals from other life accounts that exceed our deposits. We are also left finding those accounts are often empty. And the opposite is true as well. If you allow people to make more withdrawals than deposits in your life, you will be out of balance and in the negative. Perhaps you need to know when to “close this account”? I speak often about being messengers here on earth. Each of us are. What kind of messenger are you? You get to choose. Each and every day. Raising your awareness of how much you’re withdrawing and depositing into yourself and others around us, is so important. I write my blogs each week to help myself and to help others that may read them. As I choose topics that pop up during my week that get my attention, they’re turned into a blog. By doing this each night, it helps me to let go and lose control and allow God and my angels to take over and give me directions. I actually learned this from a Master’s of Manifestation retreat I went to several years ago, taught by one of my mentors, Marcia Wieder. As I have continued to do this each and every night, it has helped to transform my life. I urge you to adopt this practice too each night. As you do, I’d love to hear the results you’re getting. I hope you share them with me. So as you slow down, become more conscious of yourself and those around you, take more deep breaths more often, you will live in more joy than you ever knew existed. I guarantee it! Become aware of what you’re depositing and withdrawing in your life. PS. 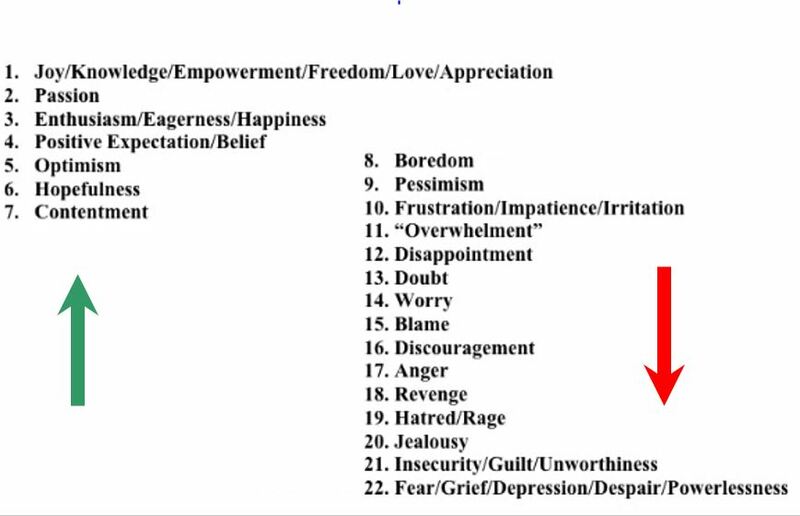 Here is the Emotional Scale I’ve been sharing each week with you. I hope you take the time to print it and look at it many times each day.